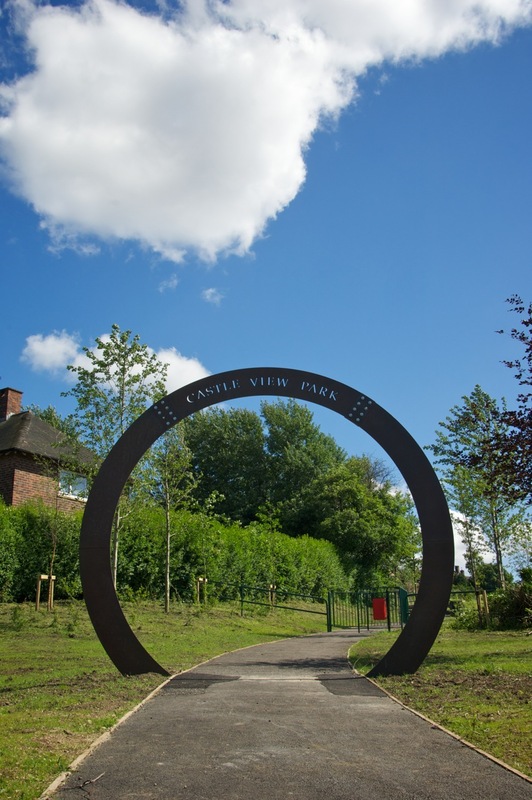 The Manor Park Art Trail was created in 2012 to encourage people to visit the new artworks that have been created . 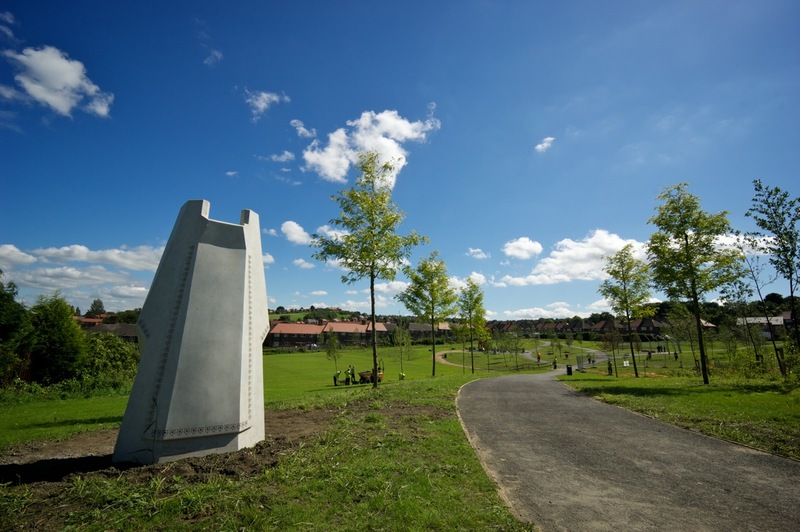 Commissioned by Pennine Housing 2000 as part of a wider program of street scene improvements, these artworks were designed to celebrate the new parks created by Planit IE landscape architects, while linking the present day community to the rich heritage of the area. Artists from Fourth Wall Creations were chosen to undertake the commission, which we did in consultation with the community and working closely with the design team. Manor Park is near to the centre of Sheffield and got its name from the fact that it was the hunting grounds for a great Manor House. Large areas of green space have always been a feature of the landscape here. 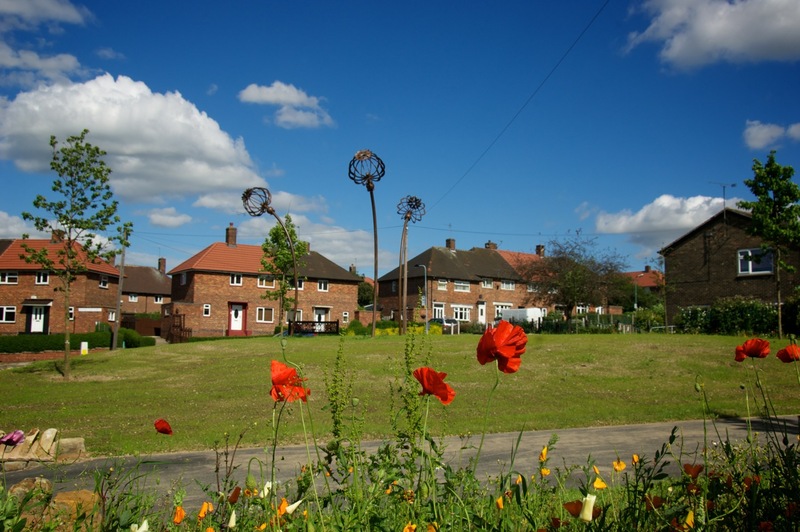 Pennine Housing recognised a need to bring some of these neglected green spaces up to the level of usable parks for local residents. Three keys areas were identified, each with unique characteristics. Fourth Wall Creations ran a series of activities, including hands-on art and design workshops and a naming competition. 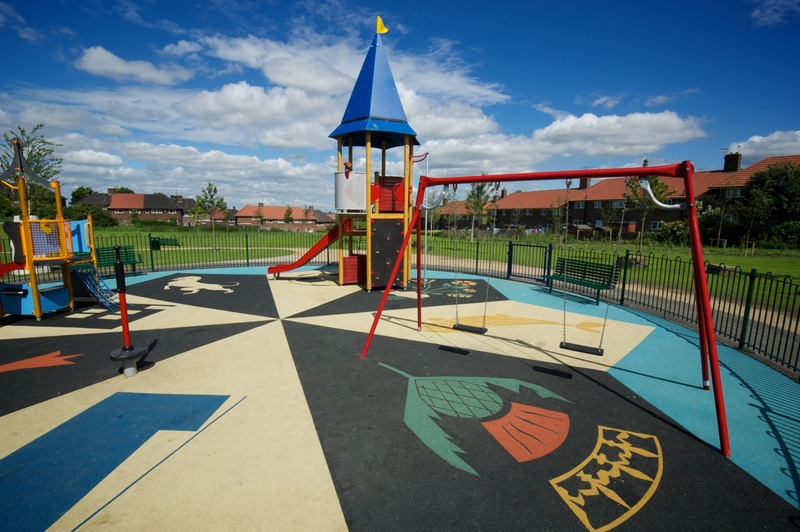 The names chosen for the new parks by the community were: Poppy Fields, Castle View Park and Seaton Field. This park name was inspired by the pastoral landscape and the recent (and spectacular) reintroduction of wildflowers into the area by Green Estate. 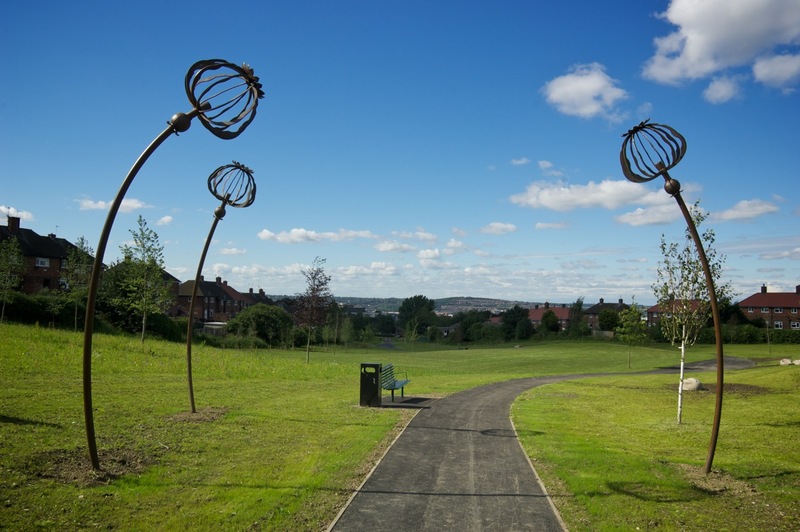 The main artworks designed for this park were 4-metre tall sculptures of poppy seed heads made from steel, with a rust-coloured finish. Tall enough to make an impact, they really serve as a landmark for this large and lovely park. In addition to this, dotted around the park, a series of concrete seating plinths were created, their amorphous shapes echoing the forms of the deer that used to graze here. 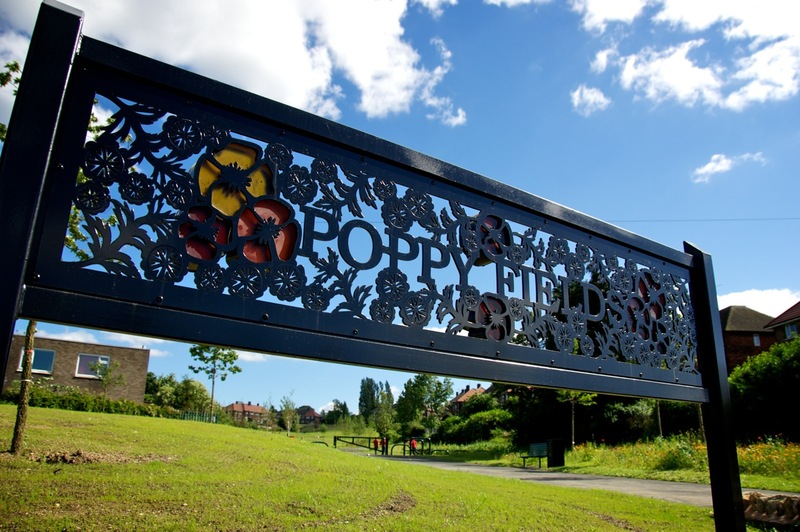 There are bespoke signs at the two main entrances to the park, made from laser-cut steel and cast coloured glass. This park is on a fairly steep slope and overlooks the Manor Lodge ruins, which are often referred to as the ‘Castle’. The artworks in this park are designed to link with this and encourage visitors to look around them and enjoy the views, as well as maybe questioning why things look the way they do. There are 2 circular steel ‘frames’, one at the entrance to the park and another at the brow of the hill. This main arch has a bench situated directly behind it so that visitors can sit and enjoy the view of the ruins. 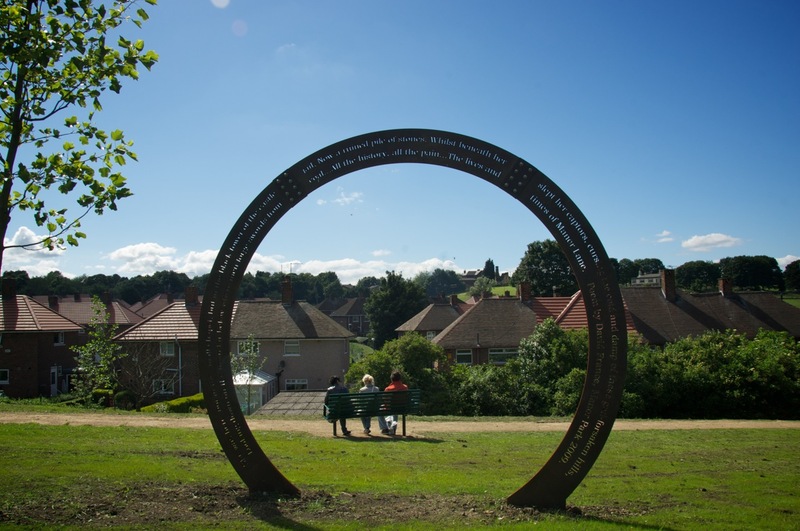 Cut into the steel frame is a poem written by a local resident, which explores the many changes that have helped shaped the landscape in this area. There is a small community orchard at the back of the park, with a bespoke plaque at the base of each, commemorating a local hero. 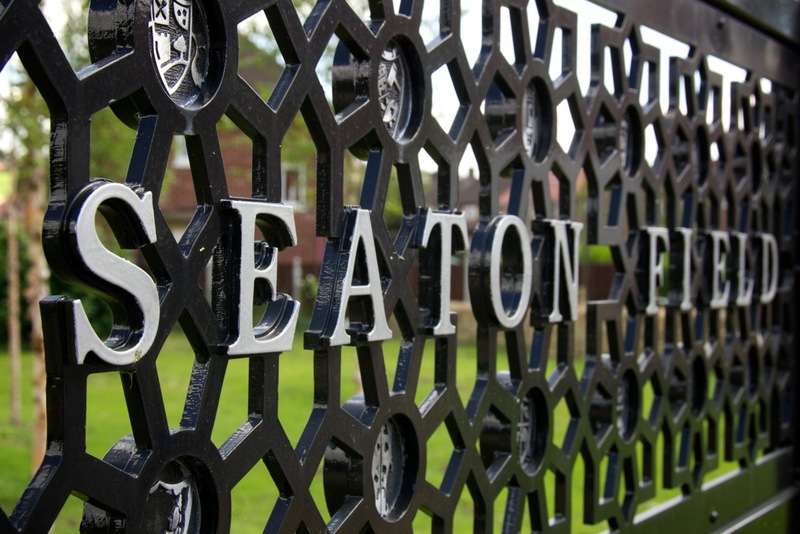 This park links most strongly with the Tudor history of the area, as the name ‘Seaton’ comes from one of Mary Queen of Scots ladies in waiting. She was known to be an excellent hairdresser, as of course she did the Queen’s hair. At each of the 3 entrances to the park stands a ghostly figure, a stylised dress or apron shape, cast from pale concrete. The fourth lady stands guard over the children’s play area, which has a colourful bespoke play surface designed with heraldic symbols, some historic, some invented. At the 2 main entrances, there are signs showing the park name which also incorporate cast metal discs containing coats of arms created in collaboration with local school children. 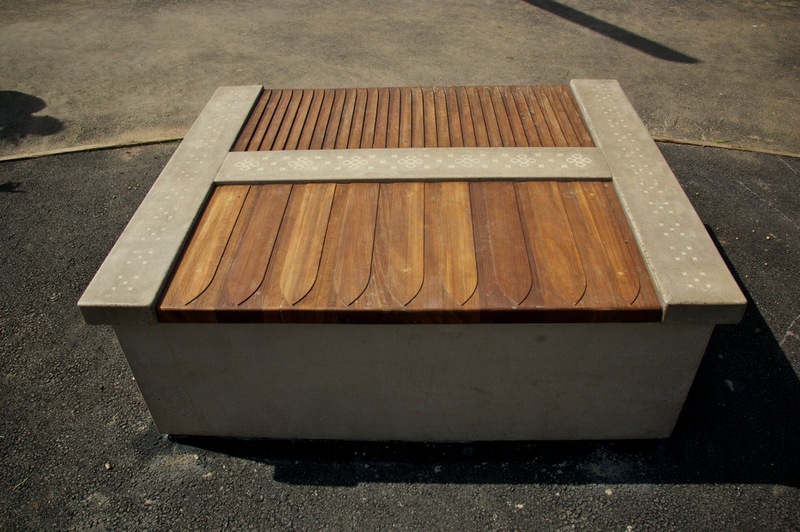 Within the central pergola are two bespoke concrete and wooden seats whose design echoes that of Tudor hair combs. Thanks to Diane Jarvis for her great photos. 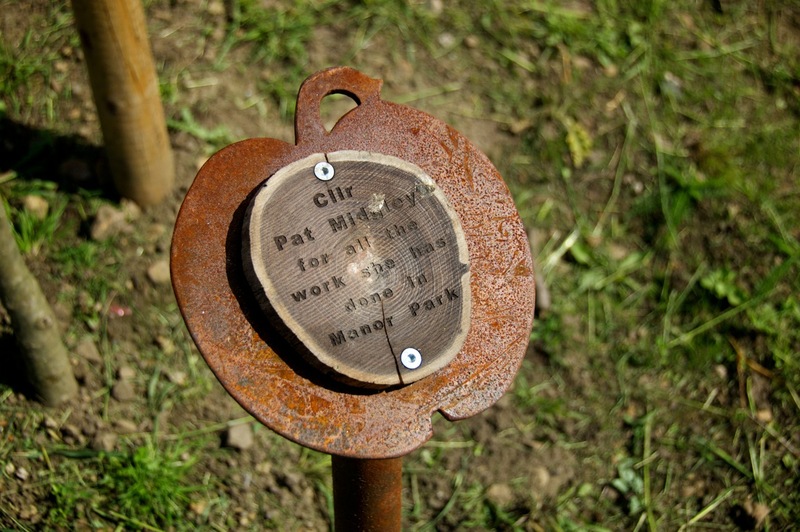 visit the project blog at: http://manorparkgreenspace.blogspot.com. To see Fourth Wall Creations’ other work visit their website: http://www.fourthwallcreations.com. For more information on the local history, http://www.manorlodge.org.uk.